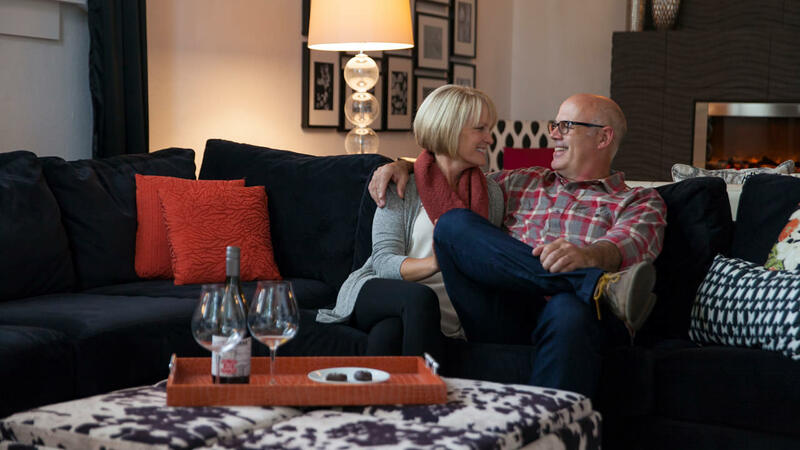 Newberg — Wine country in winter, also known as cellar season, is all about finding joy in the coziness of the season — drizzly skies, crackling fireplaces and wool blankets for comfort while you linger over exquisite pinot and find a new favorite bottle to take home. Find dozens of tasting rooms to explore between Newberg and McMinnville, with winter discounts and romance packages and special events such as winemaker dinners to seal the deal. (Make sure to call before you go since some hours are limited in the winter.) Foodies can raise a glass to the fine dining options in the Newberg area, such as The Painted Lady Restaurant, with its Wednesday evening experimental dinner series, and Recipe, with its winter prixe-fixe dinners. Beer lovers will adore the rustic vibe at Wolves & People Farmhouse Brewing. McMinnville — Six miles west, downtown McMinnville is a compact, walkable epicenter of boutique shops, tasting rooms and eateries. Make your basecamp at the boutique Atticus Hotel or adjacent 3rd Street Flats and stock up on beverages and gourmet snacks at Red Hills Market on the ground floor of the Atticus. Venture out to the excellent tasting rooms nearby, including Youngberg Hill (which also hosts a 9-room inn), Durant Vineyards (where you can sample the fine olive oils and tour the olive mill in the summer) and Winter’s Hill Estate, perched atop the fertile Dundee Hills. Dine at Bistro Maison or the beloved Nick’s Italian Cafe downtown. 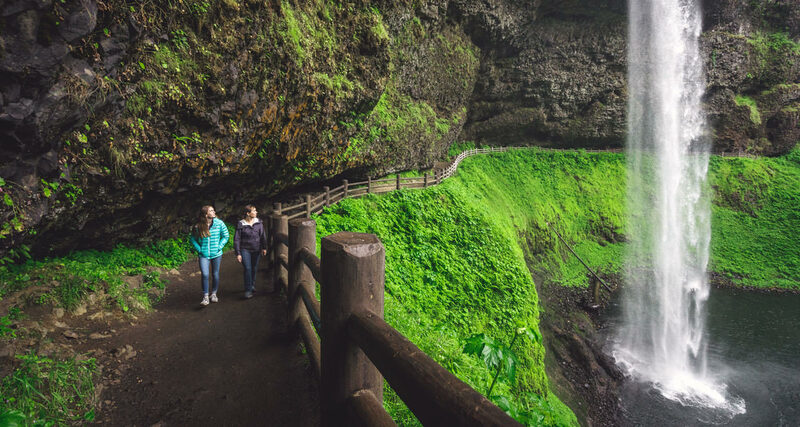 Silverton — If it’s tranquility you’re craving, there’s plenty of natural beauty in the mid-Willamette Valley ideal for an idyllic retreat. The McClaine House B&B in downtown Silverton is a 20-minute drive to Silver Falls State Park, where the waterfall trails are calling any time of year. Also in Silverton, the Oregon Garden Resort is a gorgeous basecamp, with cozy rooms, an on-site restaurant and spa and 80 acres of botanical gardens to peruse at your leisure, rain or shine. Detroit Lake — Fishing, hiking, mountain biking and wildlife-watching are all within arm’s reach in the Detroit Lake area, depending on your level of adrenaline for the day. Put on your layers and lace up those boots for a hike in the Willamette National Forest, then cuddle up by the fire at the Lodge at Detroit Lake or at a riverfront B&B such as the Rushing River Retreat. Oakridge — Forest lovers will want to make their way to Oakridge, a small town with a rugged heart at the foot of the Cascade Mountains. With hundreds of miles of singletrack trails, it’s best known for top-level mountain biking as well as hiking and wildlife watching in the Willamette National Forest. Stay at Westfir Lodge & Mountain Market, just steps from the North Fork River. 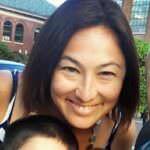 Staff at the lodge are happy to offer needed gear and adventure-planning resources any time of year. Oakridge Lodge & Guest House is a charming bed-and-breakfast downtown, a block away from Deep Woods Distillery, where you can taste small-batch spirits infused with tips of Douglas fir trees for a true Oregon experience. 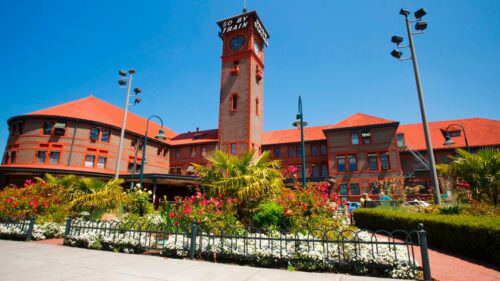 Corvallis — If it’s quirky arts and culture you seek, the mid-sized cities of Corvallis, Albany or Eugene in the southern Willamette Valley are down-to-earth, budget-friendly places to explore with your sweetie in tow. Downtown Corvallis is on the banks of the Willamette River, with a so it’s easy to find dining with a waterfront view — try del Alma Restaurant & Bar for upscale Latin cuisine or Big River Restaurant & Bar for delicious farm to table food. 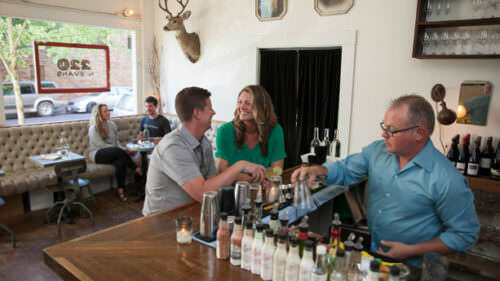 Linger over a nightcap at Castor Kitchen and Bar or one of the fine spots on the Mid-Willamette Valley Sip Trip trail and rest your head in comfort at a cozy cottage within walking distance of downtown. Or drive 30 minutes south of the city to immerse yourself in rustic beauty at BlueBird Hill Farm B&B in Monroe or Leaping Lamb Farm Stay in Alsea. Albany — The city of Albany, 11 miles northeast, is more rural than Corvallis but also chock-full of romance — go for a complimentary mineral soak and sauna at Edelweiss Manor, a restored farmhouse with art studio and gardens on site. Hold hands with your sweetheart on the historic Albany Carousel together and dig into seasonal Dungeness crab and other farm-fresh cuisine at Sybaris Bistro (call three days ahead for the Seafood Tower). Catch the latest arts, wine, theater, music and other events in Albany’s charming downtown district at the city’s event calendar, and find more awesome trip ideas here. 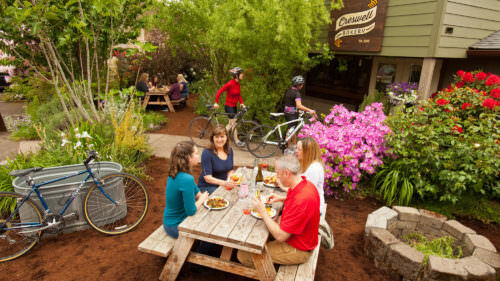 Eugene — An hour south of Corvallis at the south end of the Willamette Valley, Eugene is another epic destination for couples looking for funky eateries, pubs, wine bars and coffee houses as well as a deep well of arts and culture. 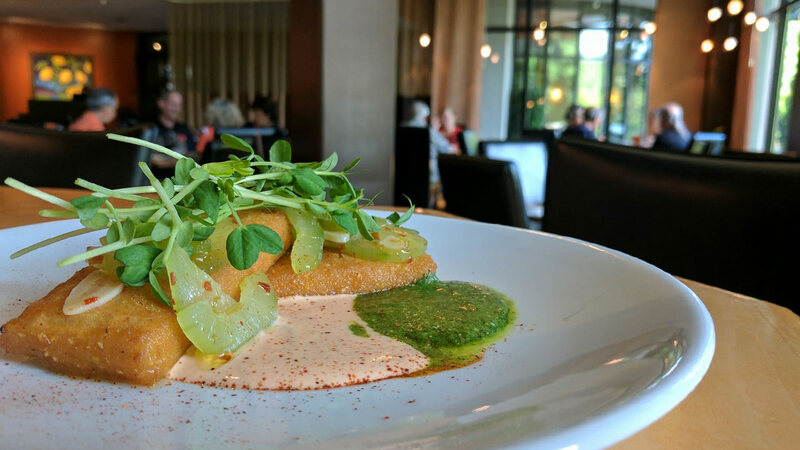 Indulge in some of the city’s top dining at Marché Restaurant, then catch an art walk, show, exhibit or concert at Hult Center for the Performing Arts or Jordan Schnitzer Museum of Art. Retire to your stylish retreat at the plush Victorian Campbell House Inn or The Mims Historic House, both in the walkable downtown blocks. Always check weather and road conditions before you go; if conditions are right for snow play, explore skiing, snowshoeing and wintry waterfall opportunities here.